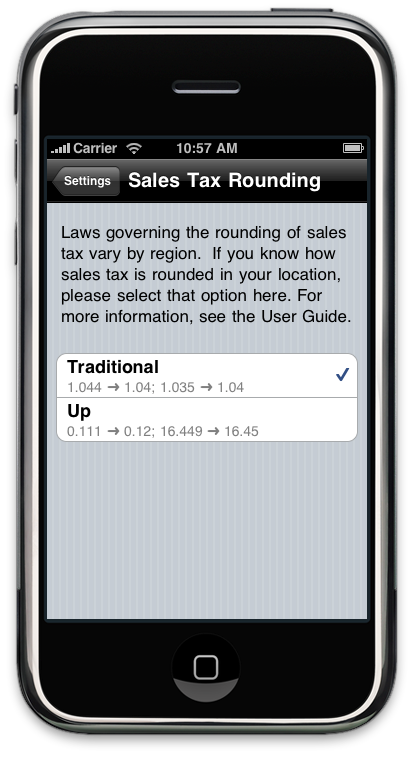 Preferences related to sales tax are specified on the Settings view, which is accessed from the About view or by tapping in the subtotal area on the main calculator view. There are three preferences related to sales tax. 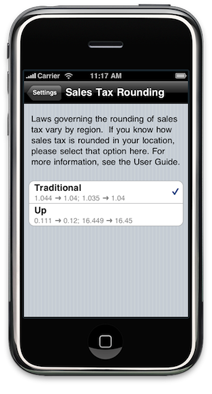 Sales Tax % is the sales tax rate charged in your location. 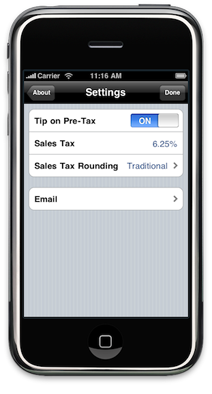 Tip on Pre-Tax and Sales Tax Rounding mode are two additional settings that control how YATC uses the sales tax percentage. When Tip on Pre-Tax is ON, YATC will calculate the pre-tax amount from the entered post-tax subtotal and sales tax percentage. The Exact tip calculation will then determine the tip from the pre-tax subtotal. If Tip on Pre-Tax is OFF, then the Exact tip calculation will determine the tip from the post-tax subtotal as entered. All other tax calculation methods are derived from the Exact tip calculation results. The tip transaction summary email will include sales tax information, including the calculated pre-tax subtotal, only when Tip on Pre-Tax is ON. 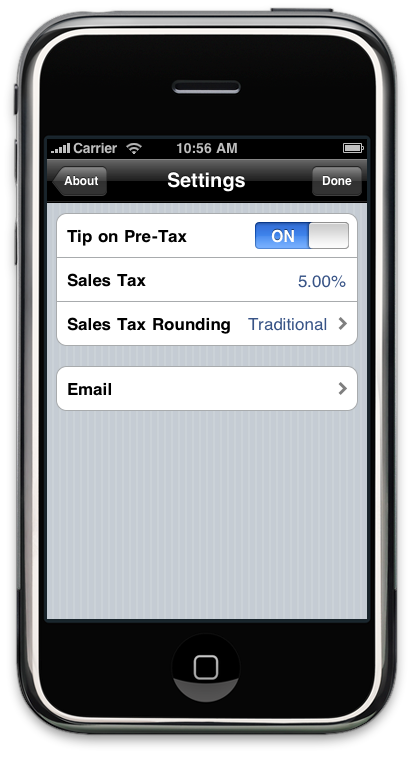 Similarly, the main calculator view will display the entered sales tax percentage in the upper right of the subtotal area only when Tip on Pre-Tax is ON. 5.235 rounds up to 5.24. 0.357 rounds up to 0.36. 6.924 rounds down to 6.92. 8.240 rounds down to 8.24. 2.131 rounds up to 2.14. 9.291 rounds up to 9.30. While these rounding modes will cover many regions, they are not perfectly suited for states such as Florida, which use a bracket system for calculating sales tax. The app could have been designed to allow you to enter the exact tax amount, but doing so would clutter the interface and defeat the intended simplicity.